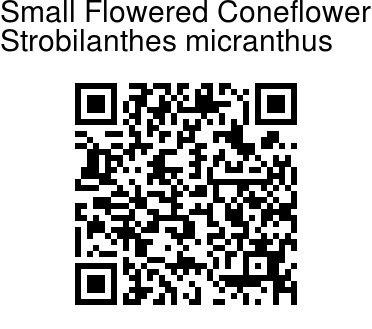 Small Flowered Coneflower is a shrubby or herbacious plant. Stems are 4-angled and hairless. Leaves are long-stalked, broad ovate, toothed, abruptly long pointed, narrowing at the base into the stalk. Leaves are somewhat rough above, net-veined and sparingly velvety on the underside. Flower-spikes, arising in leaf axils, are drooping. 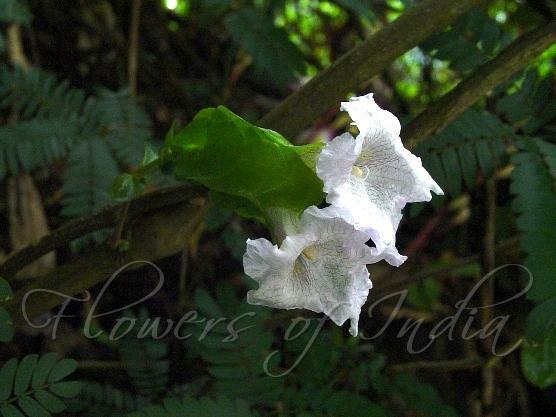 Flowers are funnel- shaped, white in color, unlike the usual blue in Strobilanthes species. Bracts are ovate, lanceshaped, pointed, the lower ones leaf-like, velvety, those above membranous. Bracteoles are linear-lanceshaped, longer than the sepal cup. Small Flowered Coneflower is found on the Nilgiri Hills.